Some time ago while looking through an old set of encyclopaedias when I found some pictures of road signs. Two of the interesting signs are shown above. 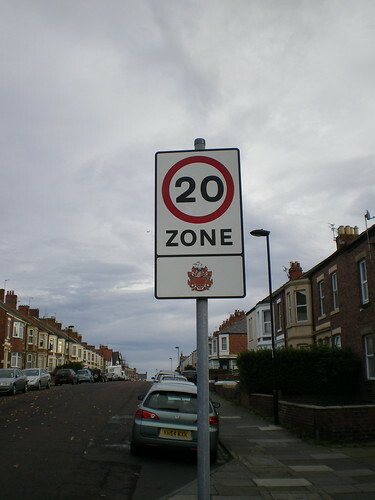 I've never in my life seen a "play street" sign in the UK, and these days the country seems to have great difficulty in putting up 20 mph speed limit signs, let alone 15 mph signs. However, both of these things were apparently possible in when my old encyclopaedia was printed back in 1959. A motor-car, motor-cycle or any other mechnically-propelled vehicle is a lethal instrument ... A great deal of fun has been made of the man with the red flag who walked in front of the early cars ; yet the authorities of those days had the common sense to foresee, however dimly, the consequences of letting mechnically-propelled vehicles loose on the public highway." "The general mixture of cars, motor-cycles, pedal cycles, and pedestrians has resulted in a toll of death, bereavement, and maiming that is horrible to contemplate and that constitutes a shame and a disgrace to 20th-century civilisation. It is a disgrace because most accidents are avoidable. Mechanical causes (like the failure of the steering gear) are nowadays rare. Bad weather, especially fog and icy roads, can at any time be dangerous. But the great majority of accidents occur because someone has forgotten the basic fact with which this article began - that a mechnically -propelled vehicle is a lethal weapon." Of course, over here you quite commonly find the equivalent of both of the signs above, in the form of the woonerf sign which is very common in housing developments and the 30 km/h (18 mph) sign which is to be seen at the edge of all residential areas. The blue sign shown here is that which you find in a woonerf, or in English "living street". This is the modern equivalent of a play street, and the sign shows kids playing as being larger, and more important, than cars. There is a video showing streets built along these lines. The road sign pictures at the top are taken from "The Book of Knowledge" sixth edition printed in 1959. 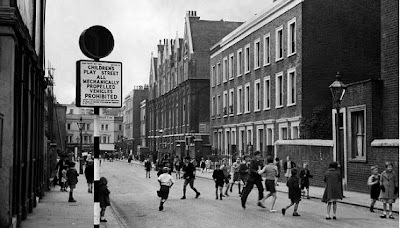 The photo of children on a play street came from the londonplay website. While play street signs are not easy to find in the UK now, woonerf signs are very easy to find. The woonerf sign came from a signpost just around the corner. There are many of them all around the Netherlands. Now there's a coincidence. I was out the other weekend photographing street signs (just don't even ask). The streets behind my house are a 20mph zone, and just a couple of hundred yards away, there are play streets. All is not quite lost here, it seems! Karl, I've seen 20 mph signs before (though not nearly enough of them) but thanks very much for sending the link to the play street sign. That's the first evidence I've ever seen that these are actually more common than rocking horse droppings in the UK. More importantly it's proof that it's still possible to have such a sign. It's a terrible shame that they're not widespread. They should be ! Their equivalent over here is seen all over the place. Thanks for the post. These signs are very important to me as they show how our culture has forgoton that it didn't always give the road to the motorcar. Would love to know if they ever existed in Australia. The Book of Knowledge! It's a long time since I heard of that! I had all 8 volumes as a kid, but that means, I think, that it might have been the edition before yours. I learned more out of that set of books than from anything (or anyone) else before or since. I just like to point out that a car is only allowed to drive "stapvoets" (at the pace of feet, so basically 5 km/h) in play streets. But what I remember most about my car training was that my instructor kept pointing to pedestrians and saying "What is he/she going to do? Cross? Run over? Follow someone else? Anticipate!" I'm glad you liked it Adrian. I also covered loss of cycling culture previously. I know you saw it before, but others perhaps didn't. Nick, there is another post with a picture from the "Book of knowledge". My parents bought a few different sets of encyclopaedias, and I spent hours reading stuff in them. They had different views on the world. This set was very British, while another set was very American and a third set that we had was very science and engineering oriented. I used to look things up in all three. Here in Toronto, we call them "playground zones." Playground zones, school zones and many residential areas are limited to 30 km/hr. I always thought Play Street (as it appears in the TSRGD, et al.) was like Anytown: a placeholder for a street's name. 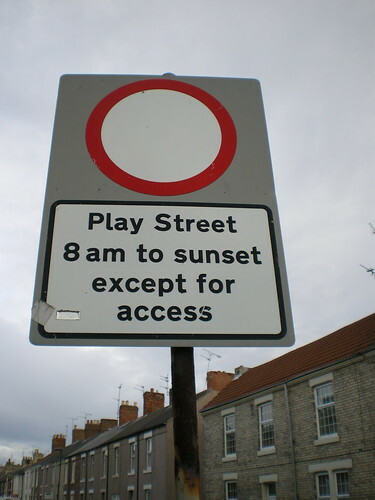 Yeah: Play Street is a placeholder for a street's name in the Traffic Signs Regulations and General Directions SI 2002. The quotes in the caption of diagram 618 (see http://bit.ly/fWZPVP) give the game away. There are Home Zones back here in the UK, but they're pretty much just a designation of shared space and "dead slow" speeds. Sustrans are pushing for more of their Liveable Neighbourhoods but because it's a Sustrans project, ... *coughs* they're almost as useless as the London Cycling Campaign. Then again, the National Cycle Network's getting quite big nowadays. I'm afraid Kevin's comment is wrong and Karl and coco are right. Play Streets are an authorised sign, but are very little used. Play streets timeline in London. TH: Thank you very much for your comment. I'm very happy to hear that Play Streets were for real. Shame there are so few of them now. The photos are excellent to see. I've added one photo and a link to the blog post to avoid further confusion. My many apologies; I was thrown by the quote marks present in the TSRGD. The image on page 3 of the PDF citation is certainly something I'd like to see returning to British streets: "[no motor vehicles] unless calling at the premises in the street" rather than the current ambiguous "except for access". Kevin: Thanks, but there's no need to apologise. It's very difficult to tell what has gone on sometimes. I should have thought clearer myself and referred back to Karl's response, the first on the post, which points to a photo of a play street which still exists. Lovelo: Thanks for the photos. hi there is a play street in Westbourne Grove London it is on Lonsdale Road, W11 2DE. you can find the Photo of it on Google maps.